The world of sport and cricket was rocked by the news yesterday that 26-year old Nottingham and England batsman, James Taylor would have to retire from the game following the diagnosis of a rare heart condition (reported to be Arrhythmogenic Right Ventricular Cardiomyopathy or ARVC). CRY’s Chief Executive, Dr Steven Cox – who Trinity has worked alongside with for the past 12 years said; “ARVC is a relatively rare condition, thought to affect between 1 in 1,000 and 1 in 5,000 people. It commonly runs in families but other factors that contribute to the disease can include viral infection, inflammation and endurance exercise. Every week in the UK, around 12 young people (under the age of 35) die suddenly from a previously undiagnosed heart condition. 80% of these deaths will occur with no prior symptoms, which is why proactive cardiac screening is so vital. Although it won’t identify all young people at risk, in Italy, where screening is mandatory for all young people engaged in organised sport, they have reduced the incidence of young sudden cardiac death by 90%. This is because sport – whilst it does not actually cause sudden cardiac death – can significantly increase a young person’s risk if they have an underlying condition. And, James’ situation also attracted huge support via social media from other sportsmen whose lives and careers had been dramatically affected in the same way – from Fabrice Muamba to CRY Patron, Andy Scott, who also had to retire immediately from playing professional football when he was diagnosed with a condition known as hypertrophic cardiomyopathy in 2005. 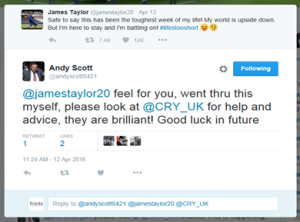 For now – and as James takes time to get well and think about his future – perhaps the final word from CRY should go to one its myheart members, who was diagnosed with genetic heart condition in 2006.